At that moment the other’s test had been completed, they both rush to view his results. “Unbelievable…” Turning to his college “ Another… But part of his DNA seems to be…” Laughing at the others findings, he pushes him out of the way to view the screen “ Impossible… How, how is this possible… Both their bio kinetic levels are off the charts, the power surpasses everyone in our department…” They both walk towards their desks and sit down… One of them looks threw his desk to find a metal flask. The other scientist reaches over and grabs it before he hand a chance to open it. Taking a gulp of the hard liquor, he passes it back to the other. “Your turn.” Taking a sip of his, an adjacent terminal lights up with an eerie figure lost in the shadows of the room he sits in. “Did you get the results of the young men?” Dropping the flask he replies, “Yes sir, it seems that our computers my have a malfunction.” Beginning to laugh he replies once again, “You see sir, it says that these two boys are estimated to be more powerful that anything we have encountered. I suggest-“ Interrupting, the figure speaks. “You suggest nothing. I don’t pay you to have your own opinions. You are using sophisticated machines; there readings are not wrong. You chose not to believe them. Now… Get back to work… “ In a flash of light, the panel turns off leaving the two scientist alone once again. “ Think we should call it a night, come back bright and early tomorrow morning?” Getting up from his seat, he looks towards the other. “I think we should get some rest as well. But before we go, begin “stage one” on Knight. The computer takes in all of the information on the boy, computing each and every DNA strand, every fault he had. A stream of liquid flows threw an entangled maze of tubes, leading to a small chamber of some sorts. Pushing a button, the procedure begins. Flashing numbers seem to count hours, decreasing from 24. “Ok its time we head out.” With in the chamber, the strands of DNA being to take shape into a mass of tissue of some sorts. Moments pass as it beings to pulsate. As if breathing with in what seemed to be oxygenized liquid. The silence with in the room is interrupted by an almost sadistically laughter, echoed threw out the room; he rises out of his chair. Walking towards the adjacent window, he is finally visible as he opens the blinds to the window. “It looks like we have to step into battle field…” Darkness around him is absorbed into one single figure, flowing into his body; there is a slight disturbance with in the time stability. Allowing nothing to escape the room, his from is somewhat flickers within a flux of electricity. The subconscious power awakened as the mind of Akito linked to battle armor. A projection of his consciences lies within seclusion as the demonic like Guyver begins to hunts the unsuspecting victim. Coming forth from the gates of Hell, or rather the chaotic mind of Akito. Holdings his hands up the other scientist pleads for his life, while contesting the others morals. “He’s just a boy don’t you see? What are you going to do, sell him off for the highest bidder?” Lowering his head to the right side, the other smiles. “See that’s the plan, you didn’t think I would waste my time helping Akito run the world into total anarchy? Your one stupid automaton, working one day to the next just seeking the praise of your master. You want your children to live within this corrupted world?” Turning around the scientist tries to grab the gun. A struggle goes on for about a couple of seconds, but is silenced by a gunshot. It seems like the one who wanted to protect his own life, lost his in his futile attempt. “I’m sorry Mark, I have to do what is right…” Looking around the ark, the scientist wanders into a room that was not found till that moment. “ What the hell is this? He looks around catching a glimpse of a pale green unit.” So this is what they’ve been looking for. The experimental unit.” Reaching over, he grabs it and holds it under his arm. Time elapses quickly; the Scientist and the prototype Dri clone have gotten away from them. Driving off, he does not look back for his eyes seem to water, emotions catching up with him for his lost son by the hands of Akito. Entering the unknown location, distant sounds seem to echo threw the area. The Guyver races towards his sanctuary, his air vents come alive as the exit unwanted oxygen into the atmosphere. 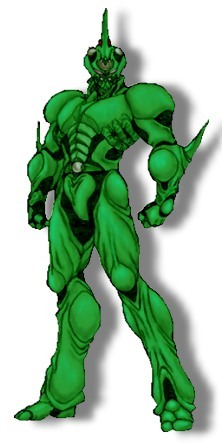 Stopping against a near by tree, the Guyver lowering his head in slight confusion, he turns to view nothing around him. An almost none emotional smile appears on his face. Biokinetic flocculation's dormant within his body seem to be the only way he is possible to emit his feelings. Pushing off the tree he looks towards the GSF base. His CM races with brilliant flashes of light, bio kinetics leaving traces of dim light from behind the medal. Unable to comprehend the severity his situation, his mind races with complex emotions trying to understand and pin point a solution to his trial at hand. Heightened by the flux of emotions, his biokinetic energies flourish around his body. With in the area of the desolation, the host of the Zero unit, Darius Keima, lays unconscious with in his “grave.” Memories seem to run threw his damaged mind, past thoughts lost to him for the time being… Contained with in a hyperbolic tube, regenerating his bodies strength or he was led to believe that this actual event took place… Within his dream state he remembers test being done on his body, unknown creatures standing over his sedated body cutting him open… Screaming out in to quite surroundings, he wakes to view his battered body. Slowly rising from the dark hovel, his weak legs help him as he uses his arms to grab hold of the top of the hole. Pulling with the last of his arm strength, he is free from the gloomy seclusion. Dri Essence: Dri Essence does not exits in the physical realm or a psychic one. It is siphoned threw existence it’s self or rather, a ‘God- consciousness” that manifests it’s self threw the entire cosmos of another dimension. This was a result of the “Chaos Theory” that had transpired more than two thousand years ago when the balance threw realties was slowly severed, growing into chaotic fits allowing this “being” to run ramped. The thread of existence had been slowly pulled and ripped causing multiple knots to be unlashed. Although the only way to explain the usage threw a bio diverse human, his powers are limited to his Antitype, Grant Knight. This usage of power is less that a faction, although allowing him similarities in attacks but with less degree of assault. Another explanation in the simplest forms, one would seek the equation e=mc2 is the theoretical explanation of forming raw matter out of energy. Dri essence is also no exception to this fact and knows this. Instead of manipulation energy, the user uses its own essence to form objects on the molecular level by expanding its essence. Contradicting this fact is the reversal of this method: Reversing the procedure by destroying the mass allows the user to receive essence and siphoning it to replace lost energies. Speed: Darius is able to make his body move faster than 120 mph in certain situations, although a strain, he should be able to sustain this phenomenon for however long he wishes. This fete is possible due to the manipulation of the Dri Energy. It is possible for him to brake down his cellular structure into an energy, or essence making it able for him to reach such speed. This gives the physical representative of a blur, or better yet, a phase capability is a fete not possible for this being. Durability: Although not known to the masses, Darius has never placed much of his dependence on Armor or any sorts with the given of the Guyver, it is known that his limited mastery of his unique gifts have made him able to create a spherical shield of raw essence, which is able to negate a limited amount of physical or gravity/energy based attacks. The mind must be so complex that is able to contain and invoke an attack as the same time. Control Medal: Compressed version allowing host interlink to be heightened. This allows the host’s brain waves to move much faster via central dome and nervous system. Within this more advanced unit, the interlink system is theorized to awaken 25% of this hosts brain function allowing host and unit different forms of Psionics depending on each host. The Dimensional Transceiver, the glowing ring, has evolved over the years as well. This allows for longer memory storage. The network format has become greater, increasing the signal and range. The data signal now allows greater bandwidth, linking more than just one mind. Gravity Controller: The siphoned energy that is used to feed the Guyver has been greatly increased. In doing so, the Guyver has developed the ability to feed from both the special and our plane. Although the energy from out plane is not as grate, it allows the unit some sort of reliable energy making gravitational forces, energies, tools and weapons much simpler than any other unit. Gravity Gyro: Another compressed version. Allowing the manipulation of energies provided by the Gravity Controller simpler. This gives the unit more speed on both ground and air that transcend most. Head Beam: Using his newfound ability to manipulate the 2 Zoa-crystals behind the head beam, the targeting systems have been increased as well as the destructive power of the laser. Sensor Orbs: They have been tweaked over the years not only to track the movement of opponents, but their sounds as well. Even the simplest sound or movement, like a rock falling, could spell death to a hidden opponent. Sonic Oscillator: Nothing much as changed with the exception of range and width. The targeting or material is not longer such a burden, but now, automatic. Energy Compressors: Mastery of these organs has led the unit to focus and compress gravity not only with his fingers, but not able to gathered into the palms. Note that the singularity does not touch the units palm resulting in the brake down of the unit’s hands. Power Amplifiers: Unlike most units, the unit has been able to couple the energies with out increased mass. The change of the gravity controller has enabled the unit to multiply the host near to 200 fold. Frequency Blades: The unit has the basic form of swords on its elbows, but unlike the Unit 3, the characteristics of the his particular host has enabled him to gain an extra pair merged with the energy compressors, adding an extra kick to the swords.